Udhagamandalam: Activists are up in arms over the police department’s decision to fell at least 487 trees, most of which are more than 50-year-old eucalyptus and cypress, spread across 10 acres at Church Hill area on Havelock Road here to set up a full-fledged parade ground for training police personnel. “It has always been a wooded area and a habitat for many birds, leopards and bears. It is not fair to destroy the forest,” Siddharth Krishnan, a resident of Have Road told TOI. “The trees are being felled in a hurried manner. Why can’t officials make use of the area housing dilapidated police quarters? After all, it is located near the forest patch where they are cutting down the trees,” advocate Reinia Santy, another resident of the area, said. When contacted, a senior police official told TOI that the wooded area belonged to the police department. “We don’t have a full-fledged parade ground in Nilgiris for training police personnel. It is a long-pending demand and now we have commenced the work to set up one on Havelock Road,” the official said. The procedure, the official said, started two years ago and all the formalities have been followed to obtain permission from the concerned authorities to fell the trees there. According to Nilgiris SP Murali Rambha, an auction was conducted at the district police headquarters on January 31 and one Kemparaj was allotted the tender for Rs 18.93 lakh. Kemparaj was given six months’ time to clear the area by felling 487 trees. “The value of trees will surely be more than Rs 1 crore. And the bidding was finalised for just Rs 18.93 lakh,” Siddharth, also a faculty member of Ashoka Trust for Research in Ecology and the Environment, said. District forest officer (north) S Kalanidhi said the forest department had granted the police department permission to fell the trees at Church Hill area a few months ago. “It was cleared by the district level committee too,” the officer told TOI. COIMBATORE: Offering local residents a unique platform to raise their issues and get them addressed, Times Connect was launched in the city on Sunday. An initiative of the Times of India, here the city residents can easily connect directly with officials and find solutions to their long-pending grievances. The first session was held at Saibaba Colony covering Bharathi Park area, K K Pudur and neighbouring areas. The interactive session that lasted for more than two hours saw residents’ many problems reaching a solution. City corporation commissioner K Vijayakarthikeyan and deputy commissioner of police (traffic) Sujith Kumar, among others, listened to their problems and also gave suggestions to solve some of them without the intervention of officials. The issues discussed ranged from stray dog menace to storm water drains turning into drainages to lack of infrastructure for implementing Sunya project to the increasing height of roads. The officials patiently listened to all the problems and offered solutions to almost all of them. Bharathi park ladies association members, meanwhile, came up with solutions to the stray dog menace. “We have already found private farms run by Snehalaya and they are located on the outskirts of the city. We need the civic body’s cooperation to catch the dogs and transport them there,” said Jyoti Prakash, president of the association. The corporation commissioner immediately ordered the zonal sanitary officer, Radhakrishnan, who was present at the event, to do the needful. He also directed executive engineer Saravana Kumar to survey and submit a report on all roads, the height of which had gone up during relaying process, and asked him to take appropriate action. When a resident sought action on illegal burning of waste in parks, Vijayakarthikeyan urged the officials to introduce composting inside the parks. As residents pitched for traffic signal at Avila Convent signal and one-sided parking on NSR Road, Sujith Kumar asked his inspectors to immediately survey the road. He said the police department had sanctioned 27 new signals in the city and they would introduce them wherever required. Regarding traffic congestion on NSR Road, he promised to deploy home guards in the area to regulate traffic. The officials have taken note of several issues, including encroachment of roads by residents, unauthorised eateries on roadsides and haphazard numbering of the residences in the area, for further discussion. The corporation commissioner has assured to inspect storm water drains at R K Naidu layout and Ramalinga Nagar when residents complained that the drains did not have proper gradient. Police officials, meanwhile, promised to increase patrolling in the area, especially near R K Naidu layout, Ramalinga Nagar and K K Pudur areas, to curb crime rates. The officials also used the platform to sensitise the residents on segregating waste and the need to install CCTV cameras facing roads. 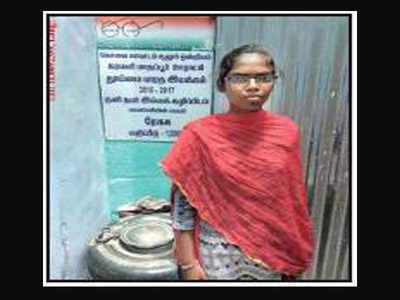 COIMBATORE: The Swachh Bharat Mission (SBM) website proclaimed that Tamil Naduhad 41.79 lakh toilets as of Wednesday morning. By evening, another 6,000 toilets were added to the landscape of the state, taking the total number of toilets to 41.86 lakh. The state, according to data on the SBM website, has built 4,000 toilets a day on an average for the past two years, trumping the national average of 1,700 a day. If that data is startling, more surprising is the sharp contrast between the number of households in Tamil Nadu having a toilet and the number of households using one. According to the fourth edition of the National Family Health Survey 201516, the latest available, nearly two of five people did not use a proper toilet, and in all probability defecate in the open. The Union ministry of health and family welfare survey says only 52.2 % households in the state were using a toilet. But according to SBM data, 63.85 % households had toilets. There is a mismatch of more than 10% between the number of households having toilets and those that use one. Assuming that all households in the state with toilets use them, the 10% increase in the number of households with toilets under the SBM could have been a jacked-up figure to claim the grant given by the Centre, and this points to a scam, say activists. This year, the state government claims that 95.03% of its population has individual household latrines and plans to achieve 100% open defecation-free status in a few months. But due to the mismatch in data, activists and politicians have called for a thorough audit of all toilets constructed across the state. Several political leaders called this number unbelievable and sought a central government probe into it. BJP spokesperson Vanathi Srinivasan said that in her native village near Thondamuthur, the scheme was not implemented properly. Payments were not credited to the beneficiarys accounts, she said. T K S Elangovan, spokesperson of the DMK, said constructing 4,000 toilets every day, even at the state level, is impossible. This is PM Modis ambitious project and it is the state government that has to implement it. If the state is providing false numbers and swindling funds, the central government should do an inspection and take action against officials, he said. Anbumani Ramadoss of PMK said that despite the project having various checks and balances, state government officials have not implemented the project as per norms. The Centre should create a toll-free number to file complaints. We will send our party men to all villages and submit reports on the toilet scam, he said. G Ramakrishnan of the CPM said that in a small village, K Madhapur in Sulur, out of 100 toilets, less than 50 were constructed under the scheme. Similarly, 30 lakh toilets will also be a false number. This is lot of public money. There should be an audit as this is a big scam, he said. When senior state government officials were contacted, they said they were aware of some discrepancies in the implementation of the SBM scheme. We are conducting audits and inspections whenever we get complaints. As far as the number goes, there are 385 blocks and more than 12,000 panchayats in the state. So, it is possible to construct so many toilets in that period as the awareness among public to set up household toilets has increased in the last two years, an official said. Tirupur: Farmers in the district have raised concern about the illegal tapping of water from the Parambikulam-Aliyar Irrigation Project (PAP) while their counterparts in Kerala are staging protests seeking supply of their share of water from Aliyar dam. The farmers, who participated in a grievance meeting on Friday, urged the district administration to form a special monitoring committee to curb the illegal tapping. They alleged that a section of farmers were involved in the over-exploitation on Aliyar-Manakadavu and Arasur-Vavipalayam stretches in Coimbatore and Tirupur districts. As many as 1.74 hectares of agricultural lands were commanded in PAP in Coimbatore and Tirupur districts. Apart from this, 7.5tmc should be supplied to Kerala from Aliyar dam. “More than 1,000 electrical motors were illegally installed in various places along PAP canals to tap water. For instance on Aliyar-Manakadavu stretch, through which water would be supplied to Kerala, at least 30% of 400mcft, the daily share for the neighbouring state farmers, would be tapped illegally,” said P Somasundaram, Tirupur district president, Youth wing of Uzhavar Uzhaippalar Katchi (UUK). Many farmers have bought small pieces of lands alongside of PAP main canals and erected bore wells, and take water to their farms located in farer places. Many farmers have even encroached few places along Thirumurthy reservoir for the same illegal purposes, said SR Madhusudhanan, another farmer. If the situation continued, it will derail the irrigation scheme as it would become impossible to provide water to the farms in the tail end of the project. But the public works department (PWD) authorities were not taking action against the violators, Madhusudhanan added. When collector KS Palanisamy, who chaired the grievance meeting questioned, a senior PWD official replied that they have served notices to many farmers who were involved in the illegal tapping. COIMBATORE: After Chennai, the most number of applications for approval of real estate projects have been received from Coimbatore, said S Selvakumar, secretary of projects, Tamil Nadu Real Estate Regulatory Authority (TNRERA), on Saturday. “So far the TNRERA has received 56 applications from Coimbatore, of which 43 had been approved,” Selvakumar said. He said this was because the city was the most urbanised area after Chennai. Selvakumar was speaking at an awareness programme for realtors on the RERA Act conducted in the city by the Confederation of Real Estate Developers Association of India (Credai). After Coimbatore, there were significant number of applications from Madurai, Trichy and Hosur. “So far, there have been no applications from Ramanathapuram and Sivaganga,” said Selvakumar. He added that the TNRERA was taking all measures to create awareness about the act across the state. “We have written to all district collectors in the state, asking them to provide information about the act to the people. We are also planning to hold awareness programmes across the state,” he said. Speaking to realtors from the city, Selvakumar said there was a plan to link RERA approval and providing of completion certificate to realty projects in areas which come under directorate of town and country planning (DTCP). “If realtors don’t get RERA approval, the projects would not be given completion certificate, without which electricity, water supply and sewage connection wouldn’t be provided,” he said. Selvakumar said many of the complaints that the body had received were about the failure to complete the projects on the agreed date. The realtors, on the other hand, raised the concern that even if they complete construction before the deadline, getting electricity, water and sewage connections were delayed due to bureaucratic procedures. They said there should be a provision to exempt realtors from penalties if the project was delayed due to getting power, water and sewage connections. Also realtors involved in projects like building retirement home said it would be helpful for them if there were separate considerations for them in the Tamil Nadu Real Estate (Regulation & Development) Rules, considering what they were doing was service. Oops! Seems there is huge vacancy of built houses, apartments all over India. This does not include lakhs of flats under construction which will add to supply in next 3 yrs. Coimbatore: The city corporation is gearing up for the Swachh Survekshan as central government officials would visit on March 1 to rank the city on its sanitation and cleanliness. All the sanitary officers and zonal workers are documenting the entire waste management schemes implemented in their respective areas. Apart from the documentation, various cleanliness works have begun ward-wise. Various campaigns are being held across the city to improve waste management. In the midst of this, fire at the Vellalore dump yard has hampered some efforts. The Coimbatore Corporation was ranked 16 in 2017, 18 in 2016, and 196 in 2015. “We hope to improve the ranking this year and come in top 10,” corporation commissioner K Vijayakarthikeyan told TOI. “Various efforts we have taken to implement source segregation will get us better marks. New bins meant for bio degradable waste have been placed on trial basis in several areas. We collect dry waste on Wednesdays in many areas,” said an official. The ministry of housing and urban affairs now proposes to conduct its third survey to rank all 4,041 cities based on the assessment of progress from January 2017 till December 2017 under the Swachh Bharat Mission-Urban (SBM-U). The data to be collected for ranking of the cities shall be segregated into 3 main areas - collection of data from and interactions with municipal body, collection of data from direct observation and collection of data from citizen feedback. In the past few months, the corporation has constructed nearly 500 individual household toilets using CSR funds . Coimbatore: At least 12 of the 19 overhead water tank projects inaugurated by state rural development and municipal administration minister S P Velumani under the Kurichi-Kuniyamuthur water supply scheme are on sites reserved for parks. As per various high court and Supreme Court orders, sites earmarked for parks by the directorate of town and country planning authority cannot be used for any other purpose. The Rs 165-crore project aims to improve water supply to nearly 4.2 lakh residents of Kurichi and Kuniyamuthur from 2019. The Tamil Nadu Water Supply and Drainage Board has started to lay pipelines from Kovaipudur Pirivu as part of the ambitious project. Under the scheme, the officials plan to set up 19 overhead tanks. RTI activists claimed that the overhead tanks can be constructed in revenue and poromboke lands in same areas as announced and protect sites reserved for parks as they are the lung spaces of the city. “Near Sai Garden layout, there is Rajagopal layout where a site has been reserved for an overhead tank. But instead of that site, they are using a park site at Sai Garden layout for the project,” activist S P Thiyagarajan said. Tamil Nadu Water supply and Drainage Board officials said the sites were handed over by the city corporation. “We are just implementing the scheme at Kurichi and Kuniyamuthur areas. It is the corporation that needs to check the land usage,” said a senior engineer. When contacted, corporation town planning officer Ravichandran said he would look into the issue. “Since it is for a public purpose, the engineering department must have taken up the reserved sites,” he said. Velumani, who inaugurated the project, was unavailable for a comment despite several attempts to reach him. A close associate of the minister, however, told TOI that the project would only benefit the people. “Yes, some of the sites have been earmarked for parks, but the project is for the people. There is not much revenue land in the corporation limits and the civic body has passed resolutions to approve this,” he said. But as per city-based activists, the corporation has no authority to change the land usage pattern. “The Supreme Court and high court orders have stated that the purpose of a reserve site cannot be changed by any authority,” Thiyagarajan said. The Tamil Nadu Water Supply and Drainage Board officials, meanwhile, said work on overhead tanks would begin within a couple of days. “We have already cleared the sites and we will start work on setting up the tanks soon,” an official said. City corporation commissioner K Vijayakarthikeyan was also unavailable for a comment. Coimbatore: The city will finally get its own bicycle sharing system on March 3 as the Coimbatore Corporation plans to launch the first phase at R S Puram with 2,000 cycles for the residents. In association with Ofo cycles, the city corporation plans to implement the bicycle sharing system and bring about a habitual change in the way people commute. A corporation official said 2,000 cycles will be available at 100 locations at R S Puram, covering an area of about 3.2sqkm. “The cycles will not have any parking stands or docks. The cycles will be placed in 100 locations that will be GPS-enabled. The cycles can be tracked using the Ofo mobile application. One needs to scan the QR code on the cycle to unlock it. Once unlocked, the riders can take the cycle to any destination and end the ride on the application. The bill will be generated and deducted from the accounts or e-wallets,” said Rajarshi Rakesh Sahai, director, public policy, government relations and communications, Ofo. The idea behind making it dock-less was to ensure cycles can be parked anywhere and are not restricted by locations, he said. “After using a cycle, it can be dropped anywhere on the road except inside a house. Using the GPS tracking system, the company officials will collect the cycle,” said a corporation official. As it the first such launch in the city, the company has come up with exclusive offers for public that will be announced on March 3. Only a minimal amount will be charged for the usage. The company has already conducted a survey and will launch a total of 20,000 cycles in the city in various areas. “Other probable areas are Sarvanamapatti, Sai Baba Colony and Race Course,” said an official. The population of R S Puram is nearly 1 lakh. After studying the transportation pattern, 2,000 more cycles will be deployed in the area. “Based on the public acceptance and usage, the bicycle sharing system will be introduced across the city,” said an official. The system was earlier launched in four city-based institutions - Kumaraguru College of Technology, PSG Institutions, Bharatiar University and Coimbatore Institute of Technology - where 100 cycles each were deployed. Minister for rural and municipal administration S P Velumani will inaugurate the launch and commissioner of municipal administration G Prakash will also be part of the event. Tirupur: A special monitoring committee appointed by the district administration to check incidents of pollution from textile dyeing units in Ganapathipalayam and Karaiputhur panchayats near Palladam has started functioning. The committee, chaired by the sub-collector, has the Tamil Nadu Pollution Control Board (TNPCB) divisional environmental engineer as the co-ordinator. It comprises of the joint director of agriculture, personal assistant (agriculture) to collector, farmers’ representatives K Rajamani and A Eswaramurthy and dying units’ representatives S Selvakumar and R Ramasamy. It should conduct inspection twice a month or whenever a complaint is made and also should report to collector KS Palanisamy every month. The collector constituted the committee following a tripartite meeting held to discuss the allegations raised by farmers in Ganapathipalayam and Karaiputhur panchayats, where as many as 40 large dyeing units are functioning. In a report, the agricultural department had said though soil in the region was not polluted, groundwater salt level had gone up. Meanwhile, some of the farmers from Ganapathipalayam said that the committee comprises of farmers, who could act in favour of the polluters. Tirupur: The city corporation has submitted a revised detailed project report (DPR) on the fourth water scheme to the state government with an estimated project cost of Rs 1,122 crore. Initially, the plan was to supply 190MLD (million litters per day) water to the city from Bhavani River under the scheme. And the project cost was pegged at Rs 850 crore. However, the project report had to be revised as the quantity of the water to be supplied was increased to 250MLD, keeping in mind the population growth. 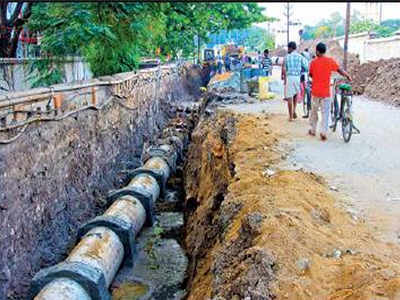 COIMBATORE : Only 23% of urban households in Tamil Nadu have access to sewerage connection, data during 2015-2016 submitted by the state government to the ministry of housing and urban affairs shows. Puducherry and Karnataka fare better with 55% and 48% coverage respectively. Minister of state for housing & urban affairs Hardeep Singh Puri had submitted the data in Rajya Sabha in reply to a question on the implementation of Atal Mission for Rejuvenation and Urban Transformation (Amrut). Meanwhile, state government officials blamed the lack of funds and limited coverage of the underground sewerage schemes (UGSS) as one of the major reasons for the situation. “Most of the schemes implemented in urban local bodies are area specific. None of the schemes have covered the cities completely. That could be one of the reasons for the limited coverage,” a senior official said, adding that UGSS cover only 33 towns and cities in Tamil Nadu that come under the Amrut scheme. Also, various factors including availability of water sources and infrastructural requirements affect the implementing the UGSS scheme, the officials said. 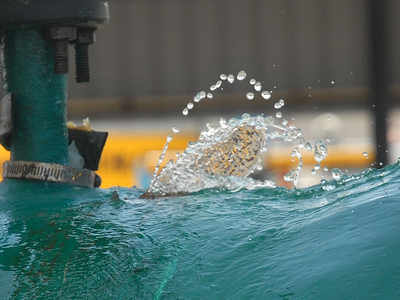 “Nearly Rs 12,000cr-worth projects will be implemented under Amrut and cities such as Chennai, Coimbatore, Kumbakonam, Tirunelveli, Vellore and Trichy will get sewage treatment plants and house service connections,” said an official. Commissioner of municipal administration G Prakash said that by June, several projects will be completed and the coverage will increase. “Apart from Chennai, 47 lakh households come under various UGSS areas. Nearly 5.5 lakh of them have already received underground connection and three lakh more households will get them within a year. The percentage has gone up since 2015 and will improve further,” he said. When asked about the delay in implementing the Amrut scheme, Prakash said that the department receives only Rs 6,000cr from the central and state governments. “We had to raise funds from the Asian Development Bank and local bodies for the work,” he said. However, social activists pointed out sluggish implementation and lack of political will as the major reasons for the poor coverage. A case in point is the sewage treatment plant at Ukkadam in Coimbatore that can treat 70 million litres per day. Instead of the one lakh connections that the plant is supposed to have, only 32,000 households have been connected to it. “To get a connection, one needs to pay bribe at every level. That is one of the primary reasons why people do not apply for the connections. Also, the charges are very high as the deposit amount as per the property tax is much more. There is also a delay in setting up sewage treatment plants, which have been in the pipeline since 2008. Proper utilisation of funds from the central government is also not happening,” said secretary of the Coimbatore Consumer Cause K Kathirmathiyon. COIMBATORE: The open space reserve (OSR) area, which is the space marked for public purpose in every residential layout, is all set to shrink. According to a circular issued by the commissioner of town and country planning on February 26, realtors can earmark OSR excluding the space for roads allocated within the layout. Earlier, 10% of OSR was allotted calculating the area earmarked for roads also. Though the percentage of OSR remains the same at 10%, effectively the open space will come down, which in turn will benefit the builders while leaving the residents with a shrunken public space. While builders have welcomed the move, activists said they will challenge this circular in court. The empowered committee met on February 7 and took this decision apparently after requests from real estate owners association. The committee cited the example of Chennai Metropolitan Development Authority where OSR is calculated for the area excluding the roads and decided to follow similar procedure in areas approved by Directorate of Town and Country Planning (DTCP). Ramesh Bafna, former president of CREDAI, Tamil Nadu said that this was a welcome move and it will benefit the residents. "The land prices will come down and everyone will benefit if this is implemented. We have been requesting the government regarding this for a long time. 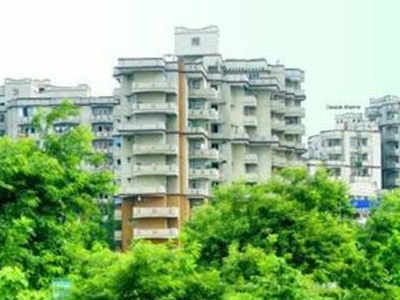 This will also help in better implementation of the central government's ambitious affordable housing scheme," he said. Activists however said that the empowered committee did not have the authority to pass such orders. "The corporation acts and government laws clearly state that OSR has to be calculated for the entire layout and roads cannot be excluded from it. This is against the government act and we will challenge this in the court," said RTI activist S P Thiyagarajan. K Kathirmathiyon, secretary of Coimbatore consumer cause said that they were completely opposed to this circular and it was issued with vested interests. "Just to please a few real estate owners and under political pressure, such a circular has been passed," he said. COIMBATORE: Plots of land will now be more affordable as the commissioner of Town and Country Planning has passed a circular reducing the minimum plot size in a layout from 1500sqft to 800sqft. In the circular dated February 26, 2018, the empowered committee has stated that the earlier requirement of 1500sqfeet affected density issues, affordability and increased land cost. Real estate owners welcomed the move and said nearly 30% of their buyers sought smaller plots. This move will open the market to that segment, they said. “For nearly two decades now, we had to sell 1500sqft plots as the Directorate of Town and Country Planning (DTCP) required a minimum setback space of 3-feet. But growing demand for land and increasing population resulted in a real estate boom in tier II and tier III cities. So, we requested the DTCP authorities to make 800sqfeet as minimum plot area in DTCP approved layouts as well. We are glad that it has been accepted,” said chairman of the Builders Association of India K Venkatesan. He said many people were buying smaller plots and constructing houses illegally. “This will help the land owners build a house legally and the government will also gain revenue from this,” he added. Ajit Kumar Chordia, president of CREDAI, Tamil Nadu, said that all these years there was a lot of ambiguity as the Chennai Metropolitan Development Authority (CMDA) and DTCP rules were different. He said more beneficiaries under the Pradhan Mantri Awaaz Yojna will benefit from this. “There is a large marker for smaller plots. We hope a similar move for completion certificate norms will also be implemented,” he said. But he ruled out any fall in land prices due to this. Senior DTCP officials said several representations had been made since 2010 on this issue. “This decision was taken to bring uniformity between CMDA and DTCP rules. Also, to increase land affordability,” said a senior official. But activists said people will continue to be affected as land prices had sky-rocketed and buying smaller or bigger plots had become extremely difficult. “Apart from reducing the plot size of the layout, the DTCP should ensure that promoters become more rational in pricing the layouts. Wherever the prices were high, they need to bring them down. Even the registrations had come down and the government was losing revenue because of this. Instead of helping real-estate developers, they should help buyers by reducing the land costs,” said K Kathirmathiyon, secretary of Coimbatore Consumer Cause.